Headphones are still a terrible gadget to shop for, but I did settle on the Woodees IESW100L BLUES Noise Isolating Earphones with 3 Button Microphone (Black). Bose & Skullcandy were out because they aren’t good, and they are overpriced. Beats by Dre are a good pair, but I wasn’t going to pay extra for his name on them, plus, the bass is too overpowering on them. I narrowed the decision down to Sony, Shure & the Woodees. I’m currently boycotting all things Sony due to their anti-consumer practices in their game division, so they didn’t make the cut. It really was a coin toss between Shure & the Woodees. After reading a ton of reviews I decided to go with the boutique brand. Onto the Woodees IESW100L BLUES. They are by far the most comfortable headphones I’ve ever worn. 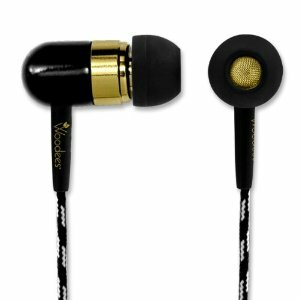 I generally hate sticking earbuds in my ears, and I’m happy to walk around with these suckers in. I’ve been wearing them for hours without the slightest hint of discomfort. They are light-weight, and they come with four different size adjustments. It was easy to find the right size for my ears. The bass is full without overpowering. The mids are so rich. The highs are clear but a little subdued which I generally prefer. I have a hard time listening to strong highs for extended periods of time; especially through headphones. They come equipped with the three button controls for newer iPods. I don’t have a new iPod so it doesn’t impact me much, however it is nice to know that they are their should I choose to upgrade. The headphones don’t identify which bud is left and which is right. I had to listen to an album where I knew the speaker orientation to figure it out (The bud with the bottons goes in the right ear). There isn’t enough high-end to replicate screaming guitars when solos hit very high peaks. While not the end of the world I really noticed it during the heights of Kirk Hammett’s solo in Metallica’s Fade to Black. I’ve got no serious complaints so long as they last me a few years. If they happen fall apart, I will update this. I’ve put the Woodees IESW100L BLUES through their paces on rock, blues, grunge, rap, metal, folk, country, classical, and a lot of stuff that resides in-between the genres, and I’m thrilled with the purchase. They especially shine on acoustic guitar tracks. Listening to Jeff Buckley’s Lilac Wine through these headphones blew me away because I could hear more of his acoustic guitar’s sound than I realized was captured by the recording. You can find the Woodees IESW100L BLUES for about $75.00. This is a well-written review. Enjoy your headphones! Thanks Yanchula. I should have included that in the original post. I just added it. I have a samsung s2 smartphone. Id really like to know how the mic and controls work with it. The mic and controls work well. Also, more than two years later they still work magnificently and have physically held up very well. I cart them around everywhere. It’s not like they are in a drawer.